Woodweave blinds bring a warmth and natural beauty to any room. Due to the make up of the woodweave fabric, unlike most other blinds, rather than block, they tend to diffuse the light entering the room. They are manufactured using our 20mm pleated blind system and have a colour co-ordinated tape along the edge of the blind to complement the colour of the woodweave. The rails are aluminium, slim-line in appearance and are available in either white or brown powder coated which ensures the rails will match virtually all window profile colours. The woodweave freehanging blind is designed to hang vertically and the bottom of the blind can be finished with a colour co-ordinated tape or a matching wooden bottom bar can be used. The woodweave roof blind is only available as Roman style and is designed to operate on non vertical areas such as a conservatory roof. 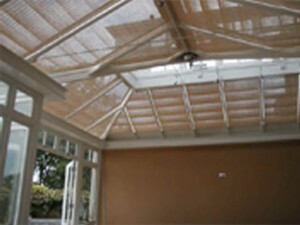 Woodweave roof blinds have three rails, a top rail, middle rail and bottom rail. The top and bottom rail are attached to the top and bottom of the window frame that the blind is to cover. Plastic coated wires are then attached to the top rail, pass through rings attached to the back of the woodweave, through the middle rail and then attached to the bottom rail. The wires are then tensioned between the top and bottom rails. The woodweave is attached to the middle rail and one of the fixed rails depending on which way the blind is to operate. The middle rail then moves between the top and bottom rails along the wires taking the woodweave with it and the tensioned wires hold the fabric against the window surface. Woodweave Roman blinds can be manufactured in a variety of shapes which makes them an ideal blind for conservatory roof areas and therefore offers an alternative to shaped pleated roof blinds. A wide range of woodweave fabrics are available, some of which are available with a solar reflective backing therefore allowing varying degrees of heat and light control. The benefits of solar reflective backed fabrics are reductions in solar gain and glare within a room during the summer and the reduction of heat loss during the winter.